Save Walton Pond – For 60 years Walton Pond had been showing her age and slowly filling up with sedimentation, invasive weeds, and slowly dying. This body of water is a critical resource to Winding Trails from a historic, programmatic, and environmental point of view. In 2010, after years of planning, permitting, and fundraising, we were able to Save Walton Pond. The entire pond was dredged, new dams built, and boardwalk installed. This $1.2 million project is the largest capital project ever undertaken by the organization. Today, Walton Pond is home to abundant wildlife, environmental programs, and numerous recreation activities. Click Here for the top donors for this project: Walton Pond Donors. Nature’s Porch – Shortly after the completion of Walton Pond, we had an anonymous donor approach us interested in establishing a nature center along the shores of the newly renovated pond. With a substantial startup money, we began efforts to design a nature center that would support our school and camp environmental programs as well as provide a gathering spot for children, families, and friends. With the support of hundreds we were able to build Nature’s Porch. It is designed to provide a place to gather, converse, and to explore. It is a CT certified grown building with all the wood harvested from Winding Trails and in the state. Click here for top donors to this project: Nature Porch Donors. 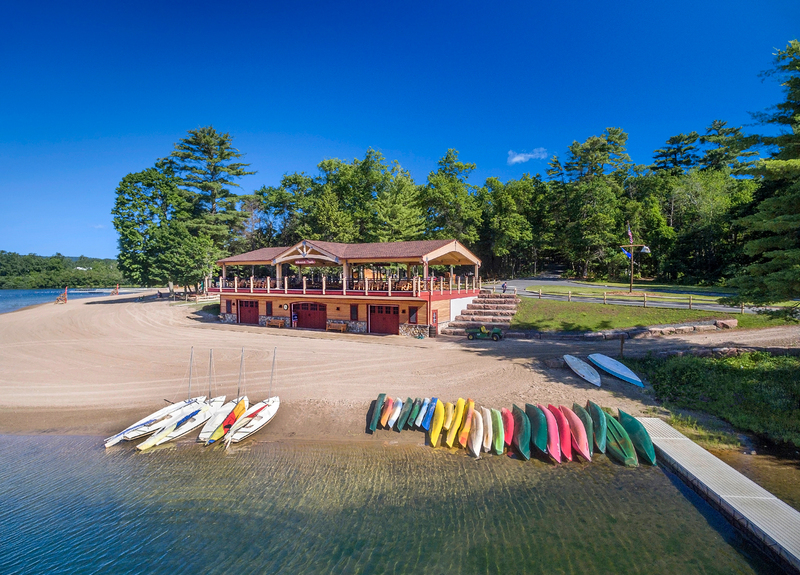 Boathouse Pavilion – In 2015, Winding Trails completed a 10 year Master Plan for Dunning Lake Beach and Picnic Area. This plan outlines 12 different initiatives to improve this vital section of the park. The first major initiative was the construction of the Boathouse Pavilion which was completed in early summer 2017. This facility provides picnic and program space for up to 200 people with a community grille area. It also provides much need rainy day space for our summer day camp program. The lower level serves as the boathouse with enhanced rental area, added storage, and training space. Click here for top donors to this project: Boathouse Donors.